Although the company founders may disagree; they were born African Aficionados. Bred, raised and fed on the bountiful harvest that has always made Africa a feast for the senses. That passion and personal connection with the African continent comes shining through in every aspect of our business. And rubs off on every client. At North American headquarters, our staff are (modesty aside for the moment) among the most prominent African safari experts to be found anywhere in North America. They know how to put it together because they have walked the walk and talked the talk for decades and decades. Some have lived in Africa, others spent time there in school or staying with relatives. All employees travel to Africa frequently on what we call ‘site inspections’. These jaunts (aside from being wonderfully fun) ensure that our staff members are kept up-to-date on new properties, renovations, transportation options and new sightseeing opportunities. Our local Africa offices mean that Great Safaris clients travel with the extra security that comes with traveling with the best company, working with the most knowledgeable safari consultants, and knowing that, once they arrive on African soil, they will be taken by the hand and gently guided through the entire journey. Our Great Safaris offices in South Africa, East Africa and Egypt are extensions of our American-based headquarters. Our African staff understand the needs, concerns and expectation of our travelers. Lost your camera? Did your luggage zipper break? Have you forgotten to take your airline schedule with you? Whatever and whenever, our African co-workers are available to you 24/7. At anytime, for any reason. Unbiased and focused recommendations Unlike those ‘big box’ travel companies, Great Safaris focuses only on Africa. And smaller yet, only on those areas of Africa that provide exceptional levels of service and excitement. We don’t own hotels or lodges; we don’t have any hidden agendas. Our mission is to simply recommend the best possible locations, accommodation and activities to suit your style and budget. And we don’t take anything for granted. Putting together a ‘trip of a lifetime’ can be hard work. Anyone can hang out a shingle and proclaim to be experts. But true professionals are made of the real stuff: knowledge, experience and lots of elbow grease. 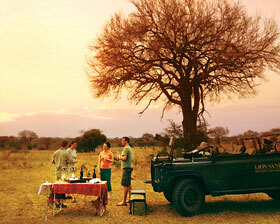 Great Safaris are made… lovingly, one at a time… and just for you.